In Resistance is Futile, artist Musquiqui Chihying creates multiple installations that present varying ways in which human beings resist the intrusion of camera. His media-archaeological practice addresses medium-specificity in the representation of image and moving image, re-discovering facts, history and truth. In Techniques of the Observer: On Vision and Modernity in the 19th Century, art historian Jonathan Crary pointed out that with the development of the optical apparatus, vision was relocated in the subjectivity of the “observer.” These observers had the sovereign and autonomous visual experience while their bodies waited to be regulated. Yet they do not conform to the standard formed by endless images and icons that visual machines produce in modern society. Therefore, there is always a tension between human beings and photographic apparatuses, between seeing and being seen. 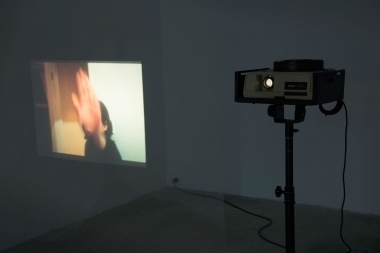 In the work Figure, the artist selected photographic images of his friends in his phone, where they consciously or unconsciously covered their faces when sensed the presence of the camera. Covering faces in front of the lens becomes a straightforward signal to resist the intrusion of the camera. These subjects are unrecognizable yet still visible and present in the images taken by the artist’s phone. The digital images are then reprinted, and displayed on films with low-resolution by a now obsolete technology. A reversed process -- the digital became the analog -- is a signature gesture in the works of this exhibition. The Camera series recreates, in HD video, historical scenes behind the camera lens in involving the representation of citizenship. Camera (36) takes the perspective of Korean athlete Sohn Kee-chung in the 1936 Olympics games, when Korea was colonized by the Empire of Japan. In contrast to Leni Riefenstahl’s Olympics, Camera (36) reverses the direction of the camera Riefenstahl deployed, imagining the working scene of Riefenstahl’s crew when Sohn was awarded. Camera (16) re-staged the room where Chou Tzu-yu, the Taiwanese member of popular Korean girl band TWICE, had to apologize for representation of her own national identity. Juxtaposing blurry images of the sites where the two events actually took place, Camera (36) and Camera (16) present the performativity of representation in front of camera on small-size films. Viewers can hardly see how Sohn hid the icon of Japan on his shirt, nor can they glimpse the reluctant facial expression of Chou. They can only imagine these acts through the HD video scenes and low-resolution imageries. Yet what represents the reality? In the work Flash, the complex tension and distortion between human beings and cameras are called into the focal point. If cameras could talk to humans, what would it say to the ready observers as Crary defined? The act of looking is sustained with the existence of light, while the blinking light makes the message difficult to be read and interpreted. In an era where citizenship and representation become part of simulacra, the hierarchy of images has to be re-defined and the truth has to be questioned. When parts of the human physicality and sensory experiences are regulated by machines, can we escape from a future of the Borg? Is resistance futile?